The SkyRunner can reach airspeeds of 40 mph, and has a 120 nm range. The SkyRunner features estimated operating costs of $50 an hour. 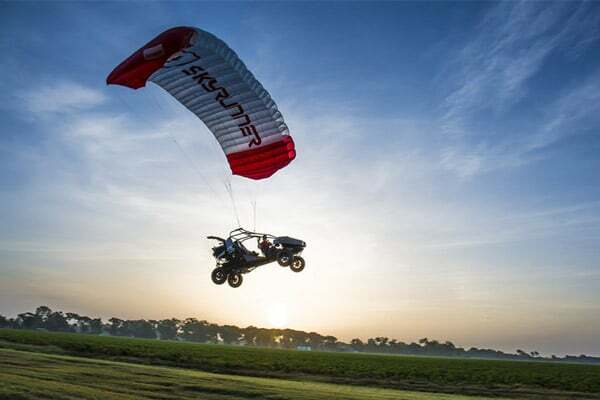 According to the company, the vehicle was developed using the latest ram-air parafoil wing technology, which is “renowned for its safety due to inherent stability, control, and resistance to stalls.” The SkyRunner can reach airspeeds of 40 mph nd has a 120 nm range. And, when not in use, the wing folds into a bag that rides behind the rear passenger. The SkyRunner is now available at a base cost of $139,000. For more information, or to order one, you can visit their website here.